Talk to someone who works at the Huffington Post these days and inevitably one word will keep popping up: “demoralized.” “I’ve never seen people so demoralized” is what a typical HuffPost employee usually says. A spike in despair makes a certain amount of sense. People are leaving the place in droves. (A huge portion of the business and tech team has fled within the last two months, for instance.) The new leadership is said to be of a particularly beastly nature. The site is going through yet another massive, and sure to fail, internal reorganization, moving its beleaguered editors into new complex groupings that will soon be abandoned. And that’s before you get to the small question of whether or not HuffPost will be sold off in the near future, due to AOL’s recent acquisition by Verizon. But to anyone who has worked at the site for any period of time, as I have, it’s a little bizarre that people could be more demoralized now than at any point in the past, because the Huffington Post has always been an essentially miserable place, with a workplace culture so brutal and toxic that it would meet with approval from committed sociopaths across the land. If things are getting worse there, they have to be really, really bad. It’s hard to imagine, to pick just one example, how things could be worse than during the Jimmy Soni era. Jimmy, you may recall, was given authority over the entire HuffPost newsroom as managing editor in 2012 based on his stellar journalistic credentials, like being Arianna Huffington’s top assistant and a former McKinsey consultant. Unsurprisingly, he ran HuffPost into the ground. His response to the rise of BuzzFeed—a development that sent HuffPost into an institutional freakout—included telling many sections that they should stop focusing so much on “news” and letting it be known that things like quality and even spelling were unimportant in a digital age. Oh, and he was a serial sexual harasser. That was a great time. People who have fallen out of favor are exiled to Siberia. HuffPost would rather not fire people, since that often comes with severance, so it torments them into leaving whenever possible. One editor was barred from all but slideshow management because she accidentally crossed a friend of Arianna’s. Others have been stripped of all responsibility, with reporters or staffers they oversee reassigned. Another favored tactic is for people to be suddenly told that they are miserable failures and given stringent story quotas and harsh warnings. The ending is almost always the same. Driven mad, people flee. Bureaucracy lays atop the organization like a frozen snow. People are foisted into strange and meaningless positions, usually involving things like “strategy” or “innovation” or “mobile,” for no reason other than that they need something to do. (HuffPost is so whacked out that it makes up worthless jobs both to punish and reward people.) If you get one of these jobs, you will be told to make up a title for yourself. A place that had sensible leadership structures and actually gave staffers a meaningful path up the ladder wouldn’t need to resort to this just to give restless staffers something to fill the hours, but there you are. The ultimate priority at HuffPost is making the dictator look good. 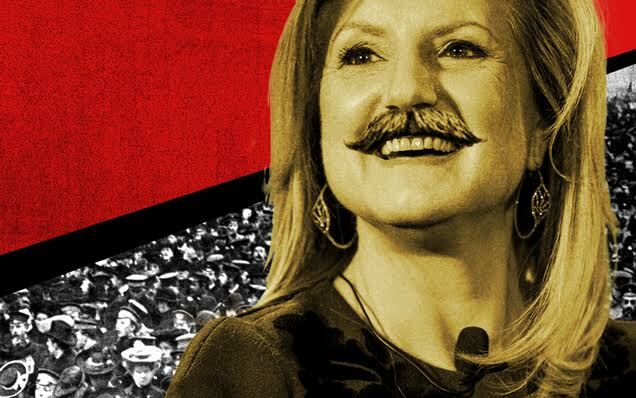 Arianna has Google alerts for “HuffPost” or “Huffington Post” or “HuffPo” and loves to forward attacks on the site to editors, whose job is then to explain why they didn’t do whatever they’ve been accused of. Sometimes her friends write in demanding that editors not use certain pictures of them, or that criticism of them be taken down from the site. Arianna usually sides with her friends. Work at HuffPost for a little while and you’ll soon learn which people—Bill Maher, or Mika Brzezinski, or the Dalai Lama, to name just a few—need to be treated delicately. If any of Arianna’s people get caught in a public mess, there can be lots of internal delays while editors figure out whether they actually have permission from on high to mention the scandal. You will also be expected to dutifully and fawningly cover any of her friends’ new projects, no matter how stupid. If a person is not Arianna’s BFF but is still a celebrity, it’s a very good bet she’ll side with them too. Aaron Sorkin, to cite just one example, almost got people fired because he didn’t like something that had been written about him (the article has now been completely scrubbed from the site). If a person is actually a corporation that threatens to pull tons of advertising from your site, like WalMart once did, it’s a decent bet that Arianna will side with the corporation too, as she did by planting an unbelievably fawning interview with a WalMart executive in the business section after WalMart expressed outrage over some tough reporting in that same section. Either way, all senior staffers wind up pursuing the same vision. Their priority, outside of a few key areas like politics, is to hire cheap and pliable employees, hopefully recent college graduates who are desperate to work for $35,000 a year. When most editors ask to hire people with any kind of track record in their field, they are inevitably told to make do with 22-year-old interns who are just starting out instead. Or they’re told that they will not be allowed to hire anyone at all. Shockingly, this process—in which hundreds of relatively inexperienced people are asked to produce bucketloads of content at top speed with next to no proper editorial supervision, all while living with ever-present dread about putting a foot wrong—does not always lead to excellence. Unshockingly, it makes people crazy. Staffers at HuffPost walk around scared all of the time. Everyone is seemingly one day away from a nervous breakdown. Every couple of years, HuffPost decides that its reputation is slipping and it needs to hire actual quality journalists. It is currently at that point in its traditional cycle, and likely offering the kinds of salaries that the hundreds of people who produce the vast majority of content for the site will never get in a million years. A cursory glance at HuffPost’s history will tell you that this new push is likely to fail. At the same time, Arianna’s new “positive” editorial priority, “What’s Working”—which, I’m told, has been openly described by senior management as a way to bring more ad revenue to the company—is being foisted on on the site, with staffers forced to come up with ever more “What’s Working” content no matter what section they operate in. Everyone is mandated to attend daily editorial meetings, which run high on propaganda and low on editorial discussion. There’s also the ongoing tale of the attempt to reorganize the structure of the verticals, which have grouped together and then split apart repeatedly over the last two years. It is all too depressingly familiar. It would be tempting to think that the rather dramatic language I’ve used is better suited to some hackneyed novel than to a 21st century newsroom, but the fact remains that being at HuffPost is actively damaging to the psyche of a huge portion of its staff. It is a very bad place to work and there is probably no saving it. Anonymous is a former Huffington Post employee.